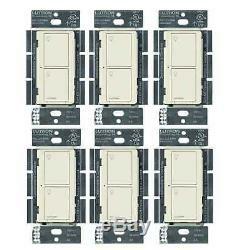 Lutron Caseta Wireless Smart Lighting Switch for Lights and Fans (6 -pack). Brand New in Original Packaging. 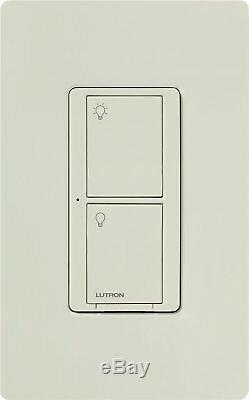 Lutron Caseta Wireless Smart Lighting Switch for Lights and Fans (Light Almond) x6. Lutron Caseta Wireless Smart Lighting Switch for Lights and Fans (Light Almond, 6-Pack). Lutron Caseta Wireless Smart Lighting Switch for Lights and Fans (Light Almond) (x6). Turn your home into a smart home with the Lutron Caseta Wireless Smart Lighting Switch for All Bulb Types and Fans. You are now able to control all the lights and fans in your home through the Smart Lighting Switch. Easy to use and easy to install with homeowners all over raving about the Switch it's worth your time and resources to experience what all the fuss is about. You won't regret it. As mentioned before, the Caseta Smart Lighting Switch is super simple to set up. It can be installed in 3 steps and it can take less than 15 minutes to install (neutral wire required). The Switch can be used in the traditional way by using it to turn on and off lights but it can also be used to turn ceilings/exhaust fans on and off. The Caseta Switch can be used with your existing toggle switch in a 3-way application to control the same set of lights. No extra smart switch is required. Ideal for areas where dimming is not needed, such as the garage or outdoor lighting. The Caseta Switch works with up to 720W incandescent/halogen/ELC/MLV, 6A of LED/CFL, or 3.6A of ceiling or exhaust fans. Basically works with every type of light bulb giving you maximum results with minimal effort. If your traveling, you can enable the Smart Away feature to have lights randomly turn on while away. You can also create'If This Then That' recipes, for example, set your Caseta switch controlling a ceiling fan to automatically turn on if your thermostat reaches a certain temperature. The Caseta Switch has the ability to connect with more leading smart home brands than any other smart lighting brands. All of this requires a Smart Bridge. Can be used for lights and ceilings/exhaust fans. Use with existing toggle switch in a 3-way application. Ideal for areas where dimming is not needed. Suitable for every type of light bulb. Can enable the Smart Away feature. Able to create'If This Then That' recipes. 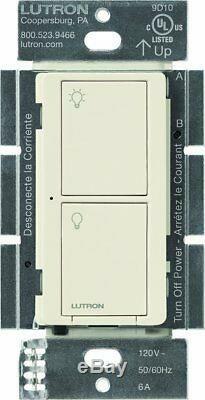 Lutron Caseta Wireless Smart Lighting Switch for All Bulb Types and Fans (Light Almond). In the Continental US Lower 48 states only. We cannot declare items at a lesser value or as gifts. F There are product categories which are not returnable due to hygienic or sanitary as required by manufacturers. In an event where there is an error regarding a price error or description, we will notify you ASAP. Items removed from their'blister-pack' display packaging are non-refundable. The item "Lutron Caseta Wireless Smart Lighting Switch for Lights and Fans (6 -pack)" is in sale since Tuesday, June 19, 2018. This item is in the category "Home & Garden\Home Improvement\Electrical & Solar\Switches & Outlets\Dimmers". The seller is "asavings" and is located in Brooklyn, New York. This item can be shipped to United States, Canada, United Kingdom, China, Mexico, Germany, Japan, France, Australia, Denmark, Romania, Slovakia, Bulgaria, Czech republic, Finland, Hungary, Latvia, Lithuania, Malta, Estonia, Greece, Portugal, Cyprus, Slovenia, Sweden, South Korea, Indonesia, Taiwan, South africa, Thailand, Belgium, Hong Kong, Ireland, Netherlands, Poland, Spain, Italy, Austria, Bahamas, Israel, New Zealand, Philippines, Singapore, Switzerland, Norway, Saudi arabia, Ukraine, United arab emirates, Qatar, Kuwait, Bahrain, Croatia, Malaysia, Chile, Colombia, Costa rica, Panama, Trinidad and tobago, Guatemala, Honduras, Jamaica, Viet nam, Uruguay.